View More In Solar Chargers. and power bank, electronic cigarette and more of the 5V USB digital products. DSLRs with compatible USB cable. The solar charger foldable is FCC, RoHS, CE certified. Short circuit and surge protected & IPX4 water resistant. 24 months worry-free warranty relieves you of quality concern. (over volt and over current will cause overheating or even shorting) and over-discharged from the battery of your device. to the sunlight to get more power from the sun. 4 hanging hoops and 4 stainless-steel eyelets on the solar charger are for easy attachment to backpacks, trees, or tents. with a power bank to store the power from the solar charging. 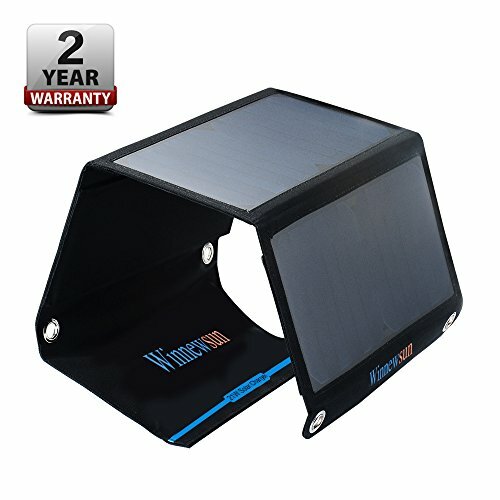 HIGH EFFICIENT & FAST CHARGING: This folding solar charger is built with powerful SunPower solar panels whose conversion efficiency is up to 24.5%; Built-in smart chip, providing steady and safe current when charging 2 devices simultaneously with USB charging dual-port. AUTOMATIC RESTART: If sometimes the charging is interrupted by the sudden shade, cloud or forest, this Solar Charger will automatically restart charging when the sunlight is strong enough. WATERPROOF CONSTRUCTION: Both the case and the solar panel are designed for waterproof purpose, but USB charging ports are not waterproof. HIGHLY PORTABLE: Foldable compact design (folded 11.4x6.3x0.7 inches, weighing only 2 Lbs) is easy to carry in a bag or on a backpack, suitable for nature trips, hiking, picnic, camping, sailing or any other outdoor activities. If you have any questions about this product by Winnewsun, contact us by completing and submitting the form below. If you are looking for a specif part number, please include it with your message.